Buy De Wit broadfork: <ul><strong><li>Lightweight tubular steel body to prevent backache</li><li>Heavy-duty carbon steel tines</li><li>Lifetime guarantee</li></strong><br></ul>Loosen and aerate larger areas of soil in less time. The De Wit broadfork is simpler than a tiller and quicker than a fork for cultivating large plots and allotments.<br><br>Just step on the plate and use your body weight to push the tines into the ground, then pull back on the handle like a lever. The sharp carbon steel tines will rise up and slice through the soil.<br><br>Lightweight and portable thanks to the hollow steel frame, this model has a 35cm wide head with alternating long and shorter tines to break up soil more effectively.<br><br>Unlike a motorised tiller, it can be used in damp soil without risk of damaging its structure by cutting it into hard ‘bricks’. 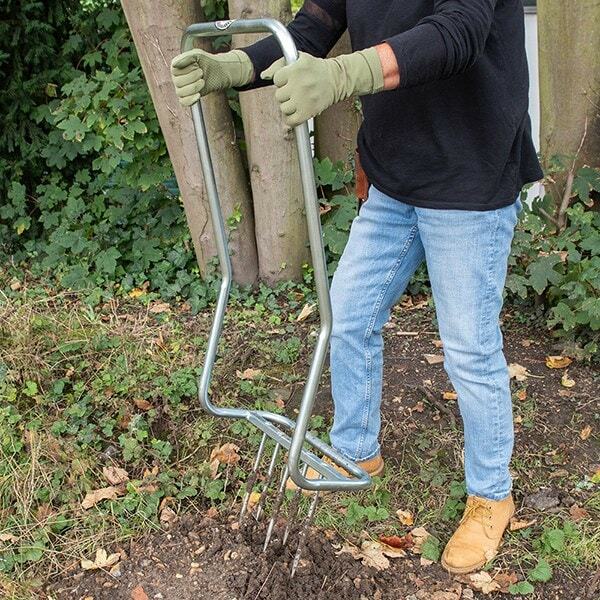 It also penetrates further into soil to make deep tunnels that aid root growth.<br><br>And because it’s silent, you can use it at any time of day without upsetting the neighbours!<br><br> Measurements:<br>Width 35cm<br>Depth 22cm<br>Length of handle 82cm<br>Total length 105cm<br><br><strong>About De Wit tools</strong><br><br>The Dutch are renowned for making the world’s finest garden tools, and De Wit is the most respected name of all. Founded in 1898, the family-owned toolmaker combines old-fashioned quality and craftsmanship with innovative design to create superior tools that last a lifetime. <br><br>All De Wit tools come with a lifetime guarantee against manufacturing defects, making them a truly once in a lifetime purchase. Loosen and aerate larger areas of soil in less time. The De Wit broadfork is simpler than a tiller and quicker than a fork for cultivating large plots and allotments. Just step on the plate and use your body weight to push the tines into the ground, then pull back on the handle like a lever. The sharp carbon steel tines will rise up and slice through the soil. Lightweight and portable thanks to the hollow steel frame, this model has a 35cm wide head with alternating long and shorter tines to break up soil more effectively. Unlike a motorised tiller, it can be used in damp soil without risk of damaging its structure by cutting it into hard ‘bricks’. It also penetrates further into soil to make deep tunnels that aid root growth. And because it’s silent, you can use it at any time of day without upsetting the neighbours! It did our lawn good. It is a well constructed manual solution to air the lawn.